We had a very nice three-week holiday in France in May and the beginning of June. The main reason why we had to go in France was to participate in my sister’s wedding celebrations in Toulouse but we also travelled extensively in the south east of France towards Narbonne, Carcassone and Perpignan. Driving to Perpignan from Toulouse was a fantastic experience for all of us. The wedding took place on 30 May. After lunch, we went to the official ceremony at the Municipality of Castanet-Tolosan where the friendly Deputy Mayor made a nice speech on the importance of marriage. Then we went to Fiac to participate in the wedding celebrations. The setting was fantastic, the food was great and we had a lot of fun till the next morning. The next day, as you can easily imagine, we were all a bit knackered. Of course, the obvious remedy was some more beer and a very nice brunch à la française. By coincidence, Mother’s day was also being celebrated and the kids had some very nice and elaborate surprise gifts which they had prepared in Mauritius. On 1st June, we travelled to Narbonne, about 100 km from Toulouse, for lunch at Les Grands Buffets, a French gastronomic restaurant. After an excellent meal, we visited Carcassonne, a medieval town with beautiful castles and historical features. On returning to Toulouse, we promptly went to have dinner at the newly weds’ place. We really discovered the beautiful centre of Toulouse, la ville rose, on 2nd June, when we explored la Place Wilson, the Capitolium or Place du Capitole, la Basilique Saint Sernin and ended the evening with a nice picnic on the banks of the Garonne in a warm feisty ambiance. A visit to Airbus is a must in Toulouse and this is what we did the next day. We had a guided tour of the factory where we saw the insides of an A380 (no photos allowed though). Before that, we visited the new museum called Aeroscopia, where we walked through the historic supersonic Concorde, the more recent A380 as well as some older planes, including fighters. Back to Castanet-Tolosan, we chilled out in the very warm swimming pool until dinner. On 4th and 5th June, we had planned a trip to Perpignan, where Christina had to present a paper at a university conference. After a 2-hour trip, we reached la ville fleurie, settled in a nice little hotel and wandered through the colourful streets and parks of the town. We were able to enjoy the sights at the Castillet, visited the Palais des Rois de Majorque and sampled the tasty Catalan cuisine. On our last day in the south of France, we visited the bustling market of Albi and its Cathédrale Sainte Cécile before yet another nice meal in a typical French restaurant. To top it all, back in Castanet-Tolosan, we prepared a Mauritian dinner as a special thank you for the whole family. On 7th June, we bid good-bye to Chérina, Stéphane, Yves and Ghislaine and took the Intercités train for Paris. We enjoyed the bucolic landscapes and the names of the towns and villages such as Cahors, Souillac, Brive-la-Gaillarde, etc. We reached Paris in time for a barbecue dinner party organised by a friend of our uncle. We took some time to wander again through the streets of Paris on our last day, completed some last-minute shopping and had a nice spicy lunch in Matchuk’s favourite Thai restaurant. We hugged Angela and Maya before heading for Paris CDG to catch our Emirates flight through Dubai. This three-week trip was truly memorable for us! Tomorrow, the Premier League starts again. According to a majority of football connoisseurs, Chelsea is going to be the champions again, followed by Arsenal and most probably Manchester City and Manchester United. Of course, being a Liverpool FC supporter, I know, deep in my heart, that the football connoisseurs are wrong and that my team will be among the top four and will win at least one cup this year. Last year, Liverpool played very badly, with a damaged morale caused by the departure of Luis Suarez and the multiple injuries suffered by Daniel Sturridge, and with Steven Gerrard losing his influence in midfield. The 6-1 defeat courtesy of Stoke was a much needed reminder that drastic measures needed to be taken. I would have loved to be a football manager. But (the real) Liverpool FC doesn’t seem to be looking for someone of my caliber… Anyway, the next best thing is to become an armchair fantasy football manager. The last time I did that was about five years ago. 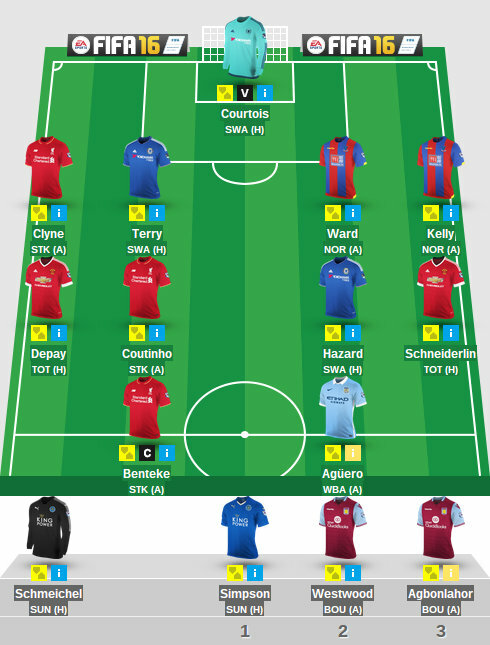 This year, out of the blue, I have chosen to participate in the official Premier League Fantasy Football competition. Not bad at all, isn’t it? With this bunch, I hope to win something at the end of the season.